Learn to play Star Wars: Destiny from our video tutorial above! As any fan could tell you, the Star Wars galaxy is filled with strange, unique, compelling characters. These characters form the foundation of the saga, giving you heroes to cheer for and villains to fear. Perhaps more than any other game, Star Wars™: Destiny gives you the chance to pit these characters against each other in unforgettable duels, limited only by your imagination. Every game of Star Wars: Destiny invites you to gather a few iconic characters for battle, using your dice and cards to defeat your opponent’s team. In our previous previews, we’ve explored the mechanics of the game, looking at the cards and dice and giving an example of gameplay. Then, we explored your two entrypoints to the world of Star Wars: Destiny: the Kylo Ren Starter Set and the Rey Starter Set. Most recently, we examined the Red, Blue, and Yellow factions of the game, revealing the unique strategies and characters that set each color apart. 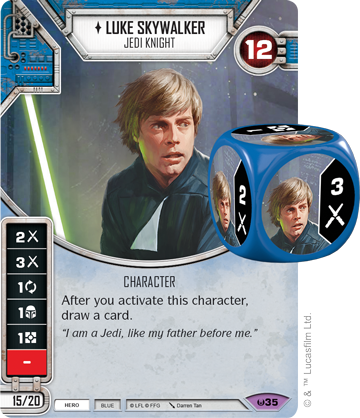 Today, we conclude our series of previews with a look at how you build a deck and choose your characters in Star Wars: Destiny! Before you ever play a game of Star Wars: Destiny, you’ll create a team of characters, drawing upon the saga’s most iconic heroes or villains to fight by your side. While the two starter sets each offer an introductory deck centered on two characters, those decks only give you the first taste of the duels that you can experience during your epic conflicts. To build a standard deck, you’ll need to expand into the Awakenings booster packs and the unique cards and dice that lie within. Every deck you make begins with a simple question: hero or villain? Though you can draw on characters from throughout the entire Star Wars saga, spanning decades in a single team, you won’t be able to include both heroes and villains on the same team. Because of this, you’ll need to decide whether you want to fight for freedom or join the dark side before you choose a single character. Once you’ve selected your side, the Star Wars galaxy expands before you. Drawing on characters from your chosen side (hero or villain), you have thirty points to spend creating the perfect team to lead you to victory. You’ll notice one or two numbers in the bottom left-hand corner of any character card. These numbers are the character’s point value—you can include up to thirty points of characters in your team. 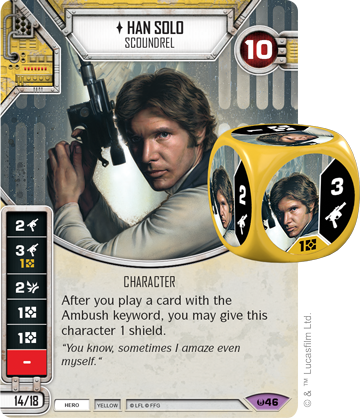 In Star Wars: Destiny, non-unique characters only offer a single point value. 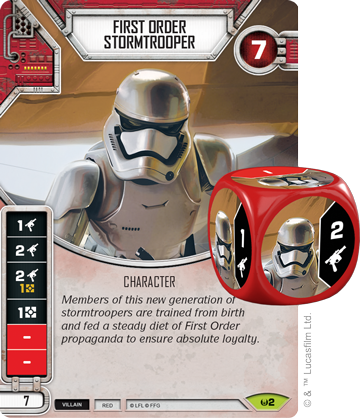 For instance, the First Order Stormtrooper (Awakenings, 2) will always cost seven points, letting you include up to four of them on your team if they’re your only characters. Unique characters, on the other hand, feature two distinct point values. The first, smaller value corresponds to the normal version of that character, which comes with one copy of that character’s die. By investing a few more points to reach the second value, however, you may choose to include the elite version of that character, which offers two copies of the character’s die! You’ll need to carefully consider whether it’s better to field the normal or elite version of a character. For instance, you may choose to field the elite versions of two characters, focusing your team on a single strategy, but that has the side effect of tying up more points in each character. If one of those characters is destroyed, your team will be far more inhibited than if you had a wider spread. Another aspect that you’ll need to weigh as you choose the characters for your team is their colors. 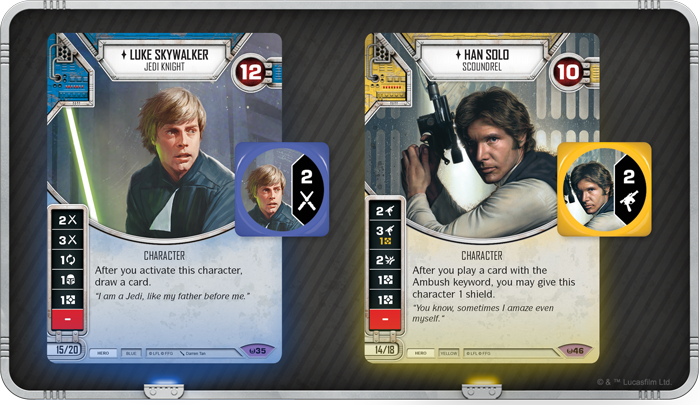 You can include characters of any color on your team, which lets you have heroes like Luke Skywalker (Awakenings, 35) and Han Solo (Awakenings, 46) fighting side by side. This also dramatically expands the variety of cards that you can include in your deck. Like characters, the cards included in your deck are split between hero and villain cards, along with neutral cards, which can be used by either side. As an additional restriction, you can only add a card to your deck if it matches the color of one of your characters. For example, unless you have a Red character on your starting team, you won’t be able to include any Red cards in your deck. Understandably, accessing two or more colors can significantly increase the variety of cards that you can include in your deck, unlocking new tactics and shoring up potential weak points. Still, you may be able to reap greater rewards by doubling down on a single color and focusing on its strengths. These kinds of choices form the heart of deckbuilding in Star Wars: Destiny. The colors of cards in your deck are determined by your characters, and there are only a few other rules that govern what your deck can look like. First, your deck must include exactly thirty cards—no more or less—and secondly, you can’t include more than two copies of any one card. The size of your deck will, in fact, play a crucial role in most games. Because you always draw up to your hand size before beginning a new round, the more cards you play or discard to reroll dice, the faster you’ll go through your deck. Obviously, using your cards like this is crucial to getting the results you need to win, but if you ever have no cards in your hand or deck at the end of the round, you lose the game. As with the Force itself, balance in all things is the key to victory. 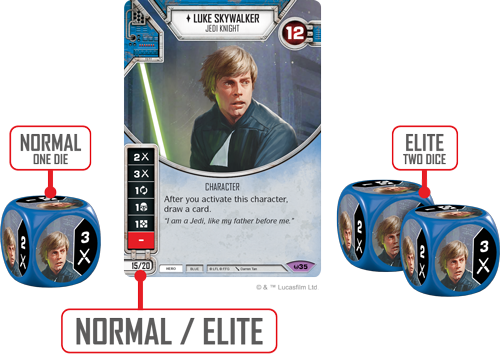 As you can tell from the few rules listed above, deckbuilding in Star Wars: Destiny is incredibly open-ended. You have very few restrictions laid upon you, giving you the freedom to mold your strategy to fit your own style of play. Still, there are many important considerations for every deck, and just one of those is deciding how many extra dice you want in your deck. At the beginning of the game, you start with only the dice on your characters, but as you play more upgrades and supports, you’ll gain additional dice from those cards, propelling you forward with more damage, resources, and special effects. Obviously, you’ll want a significant number of cards in your deck that grant you more dice, but if you include too many, you won’t have room for the events or other cards that can give you an unexpected advantage. Selecting how many dice to include in your deck is just one of the strategic concerns you’ll need to weigh before you ever start playing a game of Star Wars: Destiny—and with dozens of decisions just like it, you’ll soon find that Star Wars: Destiny is a game with massive depth. In Star Wars: Destiny, you’re invited to live out the iconic duels of the Star Wars saga or stage whatever battles you imagine. Star Wars: Destiny will soon be available at your local United States retailer! Pre-order your starter sets at your local retailer today.